Note:Since the earrings are made of natural quartz ,please allow size,color and shape may have a slight difference.Pictures were taken close to the crystals,please read the actual size carefully,you will receive one(s) similar as pictured.PS:No wearing it while sweating too much. Avoiding the chemicals and being impacted. 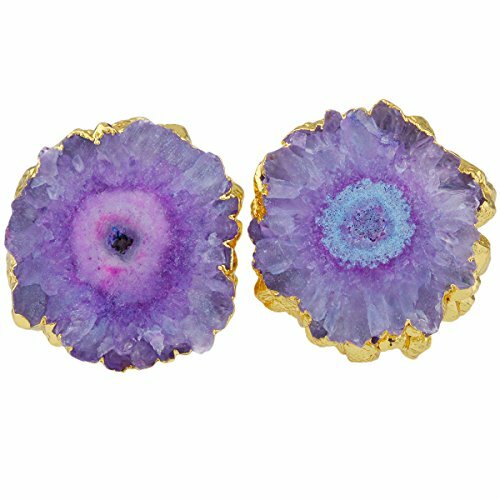 Titanium natural quartz druzy crystal stud earrings gold plated.Note:Since the earrings are made of natural quartz ,please allow chips or cracks inside the druzy.Pictures were taken close to the crystals,please read the actual size carefully,you will receive one(s) similar as pictured. Made of natural quartz;approx 0.3-0.5oz per pair,very lightweight;slicing like a sunflower,with gold plated post backing,steady and comfortale,easy to wear and take off. Simple design,fits both women and men for any occasions,perfectly suit of a wedding,anniversary,casual wearing,Christmas Valentine gift for friend and more. Beautiful color,but No wearing it while sweating too much. Avoiding the chemicals and being impacted. If you have any questions about this product by SUNYIK, contact us by completing and submitting the form below. If you are looking for a specif part number, please include it with your message.